Professional bat removal services we offer for Noblesville. Bat removal in Noblesville • Bat service for Noblesville • Eliminate bat problems in Noblesville • Bat removal and exclusion Noblesville • Remove bats in attic Noblesville • Bat guano removal from attic Noblesville • Professional bat removal Noblesville • Get bats out of house near Noblesville • Bat control for Noblesville • Bat prevention and bat pest control in Noblesville • Bat removal specialist in Noblesville • Commercial bat removal and bat management Noblesville • Remove attic insulation that is contaminated. Hamilton County Animal Control and Removal is another service area for American Animal Control® LLC, Hamilton County's most recommended wildlife-pest removal company. We provide animal-pest control and removal for all cities in and near Hamilton County, including Carmel, Fishers, Noblesville, Sheridan, and Westfield. Inventor & Installer of THE ORIGINAL RIDGE-GUARD™ Bat & Mouse exclusion system for roof ridges. Proudly using AAC PROLINE™ Traps for trapping and exclusion of nuisance animals. Raccoon removal and control • Bat removal and exclusion • Squirrel removal and control • Skunk removal and control • Ground hog removal and control • Mole trapping and removal • Bird removal and prevention • Chipmunk removal and control • Dead animal-pest removal • Dead deer removal • Fox and coyote trapping and control • Mice and shrew entry prevention • Feral cat trapping and removal • Muskrat trapping and removal • Beaver control and dam removal • Snake removal trapping and prevention. Call Now! Don't wait until your home looks like this! American Animal Control® LLC's Noblesville bat removal service and bat specialists of Noblesville provide bat removal and bat exclusion of many bats in all of the Noblesville area. The most common "bat in the house" call in Noblesville is the "little brown bat". The little brown bat of Noblesville is sometimes called the little brown myotis, a species of the (mouse-eared) bat. One of the most common of bats located in, near, and around Noblesville. A little brown bat that is found in your attic in the city of Noblesville has dark brown fur with a little glossy look on its back. On the underneath side it is slightly lighter in color and is a little greyish in the belly area. Little brown bats that live in homes and attics in the city of Noblesville and surrounding areas have a typical wingspan of 8-11 inches, and appear dark brown and almost look black from a distance. 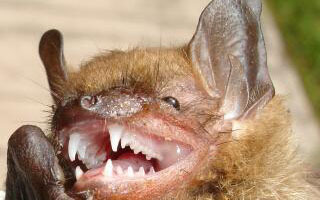 Noblesville little brown bats have 38 teeth and primarily eat insects. Most people that live in Noblesville that have bat problems, or have bats flying in the house, do not know the difference between the Indiana Brown Bat and the Little Brown Bat. The little brown bat can be distinguished from the Indiana brown bat located in the Noblesville area by the absence of a "keel" or caclar and long hairs on the hind feet that stretch longer than the toes. The little brown bats that are found in Noblesville homes hanging on walls or curtains are found not only in Noblesville but much of North America. Little brown bats can be seen roosting in attics of Noblesville homes, including, bats in eaves, bat in soffits, and bats in porch overhangs. Sometimes bats in the house in Noblesville can be heard or found inside walls or wall cavities. Brown bats frequently build bat colonies of hundreds. If you see bats flying in or around your roof or roof line in the Noblesville area, you could have a bat problem. Bat problems exist as bats build bat colonies and leave bat guano or (bat droppings) in attics of Noblesville homes. These droppings can cause histoplasmosis. American Animal Control® LLC licensed and insured bat specialists can provide you or your commercial business with a professional bat guano removal service and attic restoration from bat contamination, in all of the Noblesville and surrounding areas. American Animal Control® LLC of Noblesville provides Noblesville bat removal, Noblesville bat exclusion, Noblesville bat management, and Noblesville bat control for all home owners and commercial businesses in Noblesville. So if you live in the city of Noblesville or a city close to Noblesville, and you have a bat problem, or think you might have bat problems please consider American Animal Control® LLC for a bat entrance inspection and a professional bat removal solution. If you're looking for a Professional Bat Removal Service, look no further. Our highly trained bat removal technicians specialize in humane professional bat removal services. From removing a single bat from your home or commercial structure to complete bat exclusion services and structure repair. Our Noblesville bat removal team offers fast dependable bat removal and bat control for all of Noblesville, Indiana, and all surrounding areas. Our bat service is developed and implemented based on national bat control standards and follow all State department of natural resources laws regarding bat removal and control. 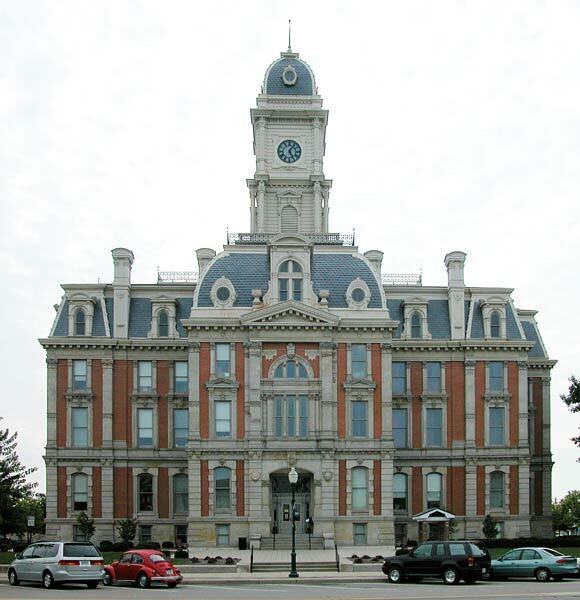 Eliminate bat problems in Noblesville. Our goal is to eliminate your bat problem once and for all. Many homeowners do not even know how serious of a health problem bats in the attic or bats in the house can be. Removing bats without addressing the entrance points where the bats are getting in the house or structure can sometimes lead to a much greater and serious bat infestation. Bat removal and exclusion Noblesville. Bat removal and exclusion work together to solve a bat problem. The bat exclusion in most cases is actually part of the bat removal process. Starting with a bat entry inspection to locate where bats are getting in the house, attic, or structure. Then identifying ALL possible entrance points where bats may try to re enter after the bats are evicted . Installing check valves or one way doors to allow bats to exit unharmed with our proprietary bat eviction device is key to any bat exclusion. Then closing down ridge vents with RIDGE-GUARD® ridge-guard.com, roof vents, soffits, and all construction gaps to properly provide professional bat prevention services. Remove bats in attic Noblesville. It's very common to find bats in the attic. Bats will typically (not always) enter the structure up high or on the roof line where they find easy access into the attic. Once you have bats in the attic they can work themselves through to almost anywhere in the home or structure. Bat guano removal from attic Noblesville. If you have bats in the attic there is a good chance there is bat guano in the attic that should be removed to prevent heath risks. We provide attic cleaning and bat guano removal once bats are removed from the attic. Get bats out of houses in Noblesville. We also provide emergency bat removal service to get bats out of your house. 24/7 we get bats out. (After hours fees may apply). Bat control is really not the best solution. Yes, we can keep a bat problem "under control" but this means you will most likely still have a bat problem. "Bat Control Service" really means we provide bat removal and exclusion. Without a entire exclusion to your home or structure you may only ever keep a bat control problem at a minimum. Bat prevention and bat pest control in Noblesville. Bat prevention is the key to success in solving a bat pest problem once and for all. Bat removal specialist in Noblesville. The AAC TEAM are bat removal specialists. Providing hundreds of bat exclusions for happy homeowners each and every year requires a entire team of bat removal specialist. We are here to serve you with any bat problem you may encounter. Commercial bat removal and bat management Noblesville. We also provide commercial bat removal and bat management services for schools, churches, factories, and bat removal for all types of industrial structures. Remove attic insulation that is contaminated from bats in Noblesville. Almost weekly our team removes contamination to attic insulation. Specialized attic insulation vacs are brought to the property that sit outside to eliminate contamination from bat guano inside the home. Hoses connected to HEPA filter containment bags are ran into the attic to inhibit mess in the home. Anti microbial and deodorizer is used before the reinsulation of attic is performed. Courthouse images are ©Janee Aronoff, myJanee.com and are used here by permission.